Day 8 – Mountain clouds – for people. for nature. When the alarm went off at 6:30, it was still dark. The forecast was for rain, so we didn’t think there was much hurry to get up and ride before the sun got too hot, so we lay in bed another half hour. But when we did get out of the tent, we were greeted by a cloudless pale sky awaiting the rising sun. It was just after 8am when we set of as the sunlight was flooding the valley, but the air was cold and it was beautiful riding. 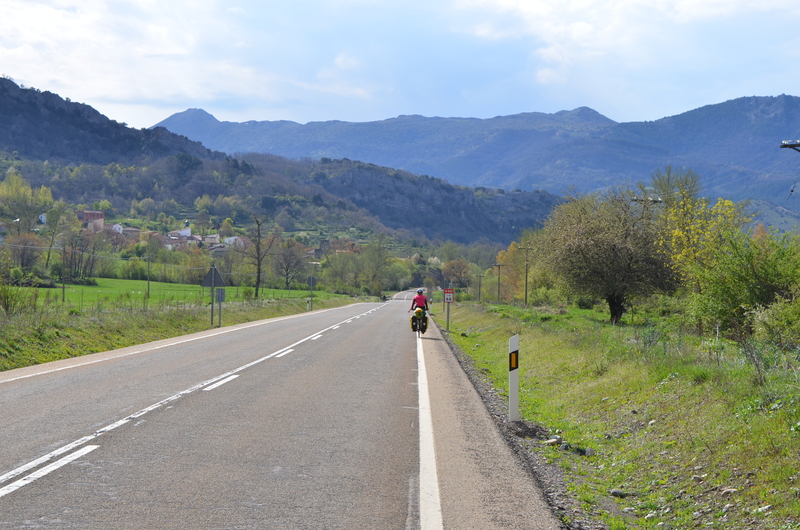 The road south out of Riano wound gently up and down as we were guided in and out of the valleys, through towns and across rivers. Thankfully we were riding in the shade of the mountains a lot of the morning, welcoming the hot sun when it was there and looking forward to the shade again afterwards. My arms and hands were sunburned from yesterday and we both had pretty sore bums, but the weather, the views and the mood were all great today and we really enjoyed ourselves. There were interesting birds to look at as well as the lovely mountains. We saw more of those cranes / storks today and quite a lot of their nests on top of tall trees and telegraph poles. There were also vultures and birds of prey around, usually riding the air currents above the high peaks. And there were hundreds of swallows darting around! 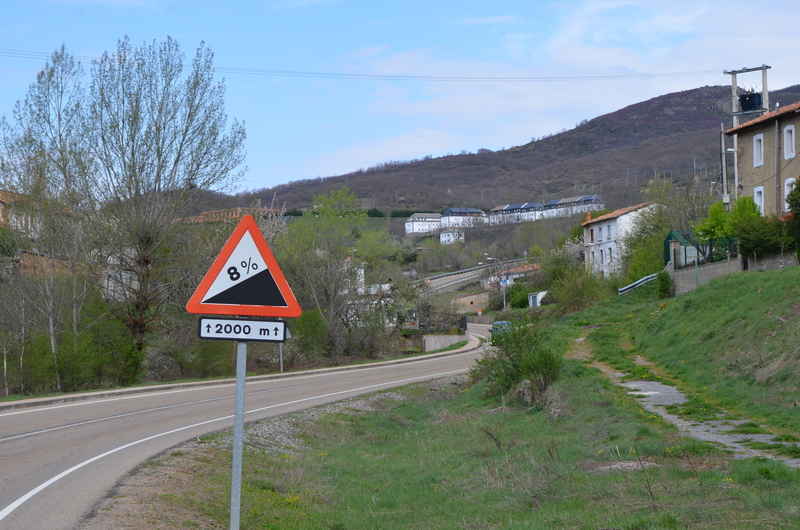 There was one big hill today, 2km of 8% and we pumped our way up to the top, thankful of the cool breeze and occasional cloud cover. Just as it started to get hot, the sky clouded over and we stopped for first lunch with our jackets on. Then we saw the rain on the mountains ahead and donned preemptive rain gear after sweating up the next hill. The rain came down hard as we rode into Bonar, our designated stop for the day, but the shower had passed by the time we got to the campsite, which turned out to be closed. On to the next town! Back up and down a few valleys, still enjoying the ride and still in the glorious shade of the clouds. 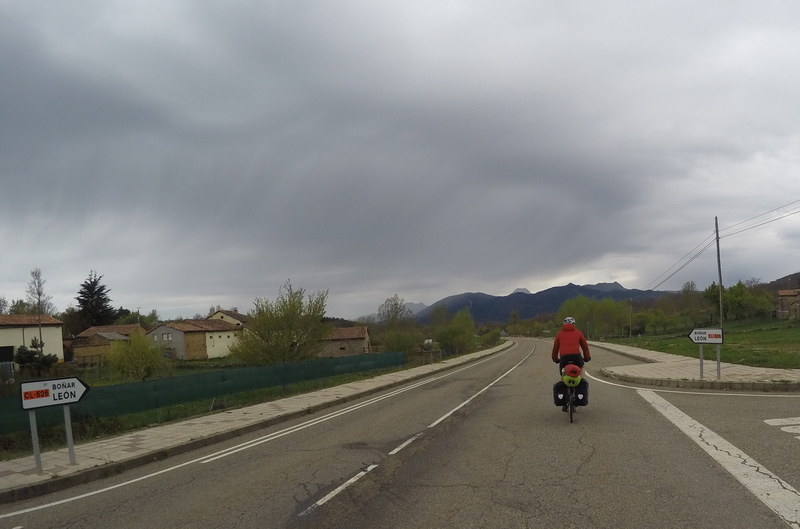 Another rain shower later, we were in Vecilla. 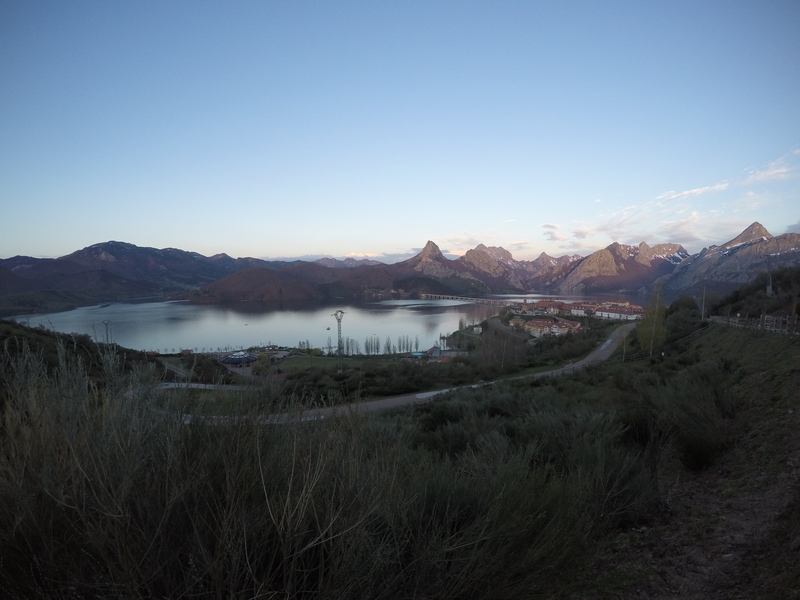 This town boasts three campsites and of the two that we could find, one was open – hurrah! It was only 1pm and we’d done 65km! Feeling pleased with ourselves, we set up camp, did our laundry, showered (bliss after several days in the river!) and headed into town for food supplies before returning to cook dinner. 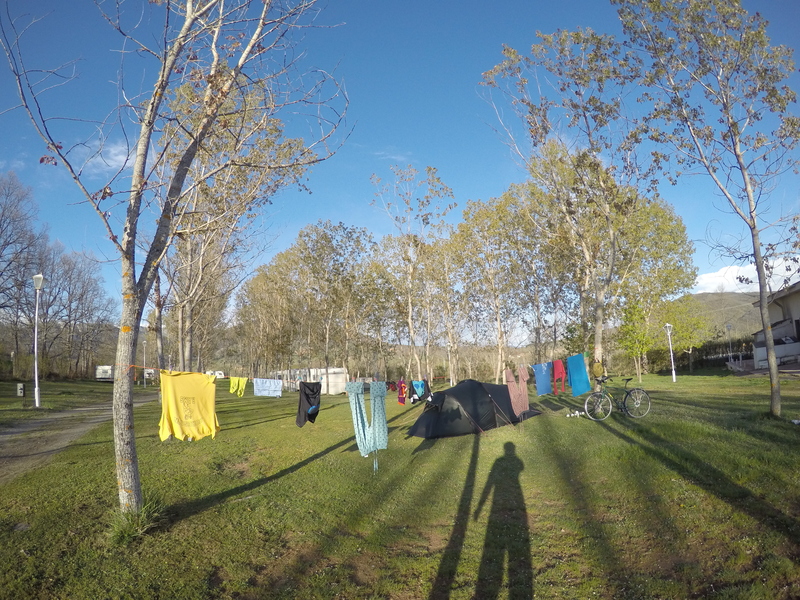 Our laundry almost dried in the wind and sun in spite of a prolonged shower, which was nice. The dinner I cooked tonight wasn’t great though and I’m glad we were both in a good mood so that it was bearable! Attempting to cook tortilla on a camping stove is not recommended. The forecast is pretty grim for the next week, but hopefully we will just have more cloudy days like today. I can’t believe it’s not tourist season yet, this seems like the ideal time to visit! Day 9 – Bad Advice!